Any report can now be opened as an Excel spreadsheet. The new Quick Text Message function makes it easy to send a text message to all event participants - and their parents! We made it much easier for users to enter their SMS addresses so they can receive text messages. Parents can give electronic permission for a scout to attend an event after the sign-up deadline. Outdoor Journeys were added for Girl Scouts at the Junior, Cadette, Senior and Ambassador levels. Cub Scouts can upload their roster from the Packmaster Web 2.0 personal data export. Treasurers for Cub Scouts and Girls Scouts can now attach receipts to group transactions. Rotate buttons are now available for individual member photos. Relay messages may be viewed from the View All Email page. Users are redirected to HTTPS on every page of the site. Troop 660 of Pike Creek, Delaware! 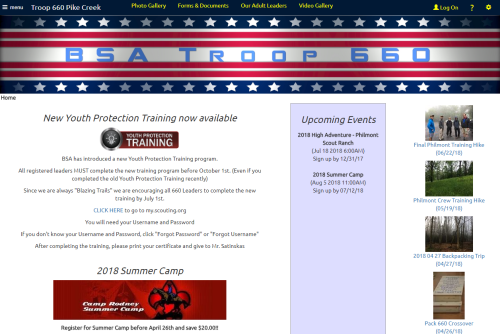 The dramatic graphics on the Home page pull you into a well-organized site that features an article about the new Youth Protection Training that everyone needs to know about. The About BSA page summarizes the scouting program for parents of prospective scouts. The About Our Troop page provides a good introduction to Troop 660 in both text and video. And the videos continue in a well-stocked Video Gallery page!